This is the first outdoor camera that I have had to wire into the mains, this allows it to work to its full potential with the floodlight never draining the battery, nor you having to mess around with charging batteries. Competing brands offer some alternative options, the Yale outdoor camera is wired but it uses USB for the power, so you only have to route the cable into your house and plug it in. Ring and Arlo both have battery-powered options, which are great if you refuse to drill holes into your house but will not offer always-on floodlights, and will require regular charging. Thankfully we had an old motion detecting lamp at the front of our house, which meant I did not need to drill any holes into the house. It meant placement was not idea for a floodlight but any other option would be far too difficult for my liking. Once you have the wiring in place, mounting it isn’t that easy either, nor is it the best design. The metal mounting bracket to the wall attaches securely, but then the housing for all the wires is plastic which is held in place with one bolt and a smaller screw. It doesn’t feel like the most secure design, but once set up there is little to no movement. Once you have it all mounted and sealed off from the weather, the set up is quite simple, similar to the previous Netatmo, you pair it up via the Netatmo security app, pass it your Wi-Fi credentials and everything should pair up. If you need to reset the device you have to show the camera a QR code, which will then restart the set-up process. With it set up in the app you have a few settings that are worth tweaking. You can set motion alert zones helping you reduce false alerts, so in my case, I reduced the motion zone away from street level so I wasn’t warned every time someone walked past. You can then adjust the floodlight settings. With the smart object detection, this allows you to have it switch on when it sees a person or car, but ignore animals or other motion. I have found this to be very accurate in object detection, it has been able to detect cats roaming my garden, and when I didn’t set up the motion zones correctly, it detected people from across the street, even though you could only just see their head. When it detects someone, it will notify you, but I have found the speediness of these notifications inconsistent. Sometimes it is instant, other times it may be a few minutes, this is fine for security but if you want instant notification that someone is at a door it is not perfect. In general, Ring is superior to this, but it does, on occasion, suffer from delayed alerts. Wi-Fi signal will be a factor, but I am unsure why both devices are good one day and less good others. The Ring Doorbell doesn’t have person detection though, but due to its placement and zoned alerts I have been able to reduce false alerts completely. Unlike the Welcome camera, this only identifies people and does not have facial recognition. It is not important, but it would be nice to have on any future releases. The floodlight functionality is excellent too, it provides some extra light when we arrive home at night, but then also as a deterrent from any would-be burglars. Unlike PIR sensors, this rarely triggers by mistake, and I have found PIR lights almost useless in specific locations due to wind moving branches or other objects. 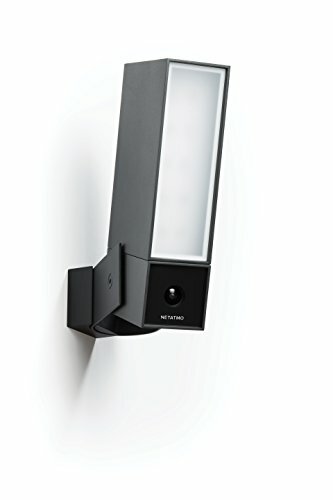 Once set up properly this works very well, it is vastly superior to a PIR flood light, and it is significantly better than most outdoor cameras due to its person detection and wired connectivity. In particular, I have had absolutely no false positives from things like moving branches and shadows, whereas with other, less smart products, I quite frequently have to limit notifications due to getting pestered every time the wind picks up. Being wired into the mains makes it a nightmare to install, and the back box feels a little lightweight, but a competent DIYer or professional installer should be able to install this and weather proof it with no problems. The Ring Floodlight is the closest competitor, and cheaper too, it appears to have similar issues with the installation being flush, and some people have problems with the WiFi range. However the big difference is that you will need a subscription, so the Netatmo maybe more expensive initially, but should work out cheaper in the long term.